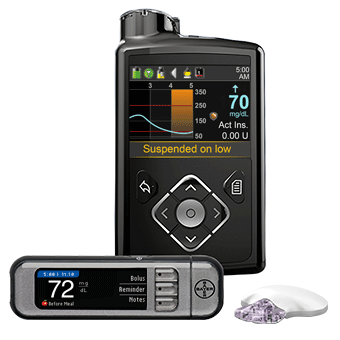 Only the MiniMed system has SmartGuard technology, which takes action for you if your sensor glucose values go below a preset level. If you don't respond to alarms, SmartGuard technology can pause insulin delivery for up to two hours - giving you time to recover. This feature automatically calculates and recommends precise bolus doses and helps you avoid insulin stacking if you accidentally set boluses too close together. The pump lets you know up to 30 minutes ahead if you're trending high or low, so you can act sooner to keep your glucose levels where you want them. The sensor wirelessly sends glucose information to your pump every five minutes, so you can see how you're doing, spot trends and make adjustments. Polished black exterior finish; easily customizable with a wide variety of personalized skins. Prices reflect manufacturer's retail price. Your price will depend uon your insurance company's allowable amount.